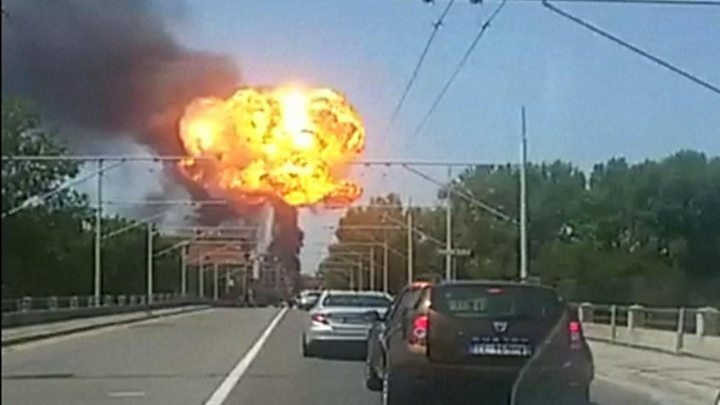 A tanker and a lorry have collided on a motorway on the outskirts of the northern Italian city of Bologna, causing a major fire and explosion. Images released by police show the tanker ploughing into the back of the lorry that had come to a stop in motorway traffic. They then caught fire, triggering a huge fireball, and the bridge they were on partly collapsed. Two people have died and more than 60 have been injured, Italian media say. The fire spread to a car park below, where several more vehicles exploded at about 14:00 (12:00 GMT). Police closed off a number of roads in Borgo Panigale, an area on the city's outskirts, causing serious delays to those travelling to the nearby airport, which remained open. The accident happened on the Casalecchio junction that connects the A1 to the A14. Many of the injured were hit by debris and broken glass from the explosion, Italian media reported. The windows of many houses in the area were also said to have shattered.